Sitting in a tropical lagoon, the beautiful South Pacific island of Bora Bora provides one of the world’s most romantic backdrops for a wedding. If you’re looking for an exotic elopement, there’s nowhere better. Our Bora Bora wedding package features 7 nights in a luxury resort on Bora Bora, a legal wedding at the Town Hall followed by a ceremony on the beach, and return transfers to the island. On your wedding day, you’ll be taken by private boat to the Town Hall, where the legal proceedings will take place. Then, you’ll head for a beach dressed with tropical blooms, where your Master of Ceremony will be waiting. You’ll say your vows, exchange traditional Polynesian flower-crowns, enjoy a champagne reception and watch the sunset over the lagoon. It’s secluded island perfection! After your barefoot wedding, you can spend your days relaxing at your luxury hotel and cooling off in the lagoon. If you want to explore further afield, we can help arrange a honeymoon spent island hopping through the rest of French Polynesia or even create a multi-country adventure, adding destinations such as Australia, New Zealand or the USA! Questions? We've got them covered. 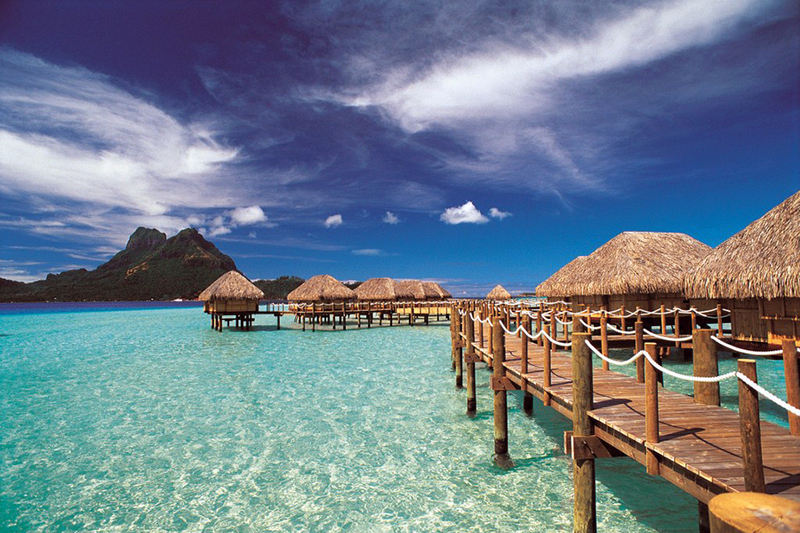 Take a look at our FAQs about getting married in Bora Bora. All of our destination wedding packages are designed to give you an idea of what is possible for your Big Day. Every Bora Bora trip can be tailor-made to suit your needs, so please send us an email or call us on 01273 964 035 to get started. The best time to visit French Polynesia is during the dry winter period between May and October, as the weather is cooler and rainfall is more scarce. From November to April, temperatures rise as the summer rainy season begins, bringing humid, cloudy weather with patches of rain. Over this period, it is not uncommon to experience brief, violent storms or heavy rain lasting several days at a time. Peak season is July and August, as well as the Christmas and Easter school holidays, when resort prices reach a premium. Our Bora Bora wedding package is purely a suggestion and can be tailor-made to your personal requirements, so please contact us and we’ll put together a bespoke quotation for you. Intimate wedding beach ceremony including flower crowns and leis, Polynesian Master of Ceremonies, musician, flower decoration on the beach and a romantic set up for dinner at Tevairoa Restaurant. Legal wedding proceedings including return boat transfers to city hall, legal ceremony, English-speaking wedding coordinator, bouquet and boutonniere, marriage certificate, witnesses (on request) and champagne after the service.